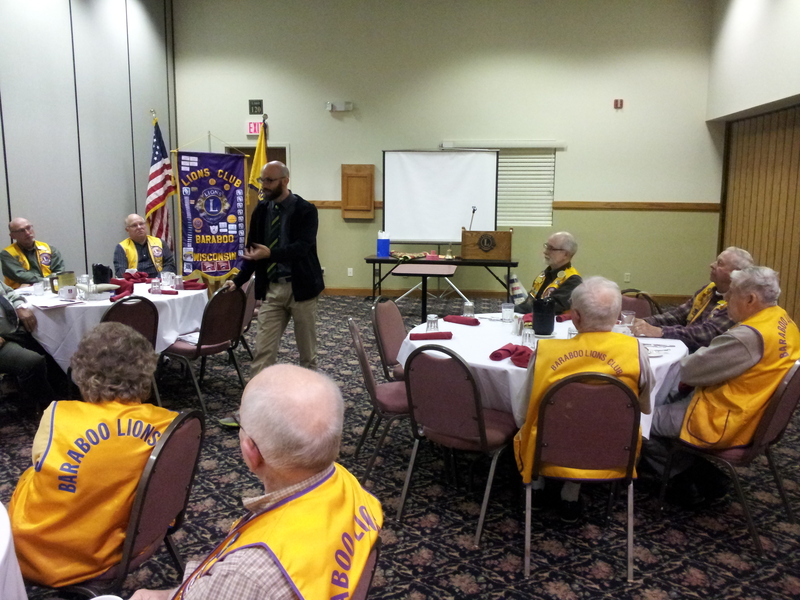 Circus World Archivist Pete Shrake speaking to the Baraboo Lions Club about his work at the Museum. 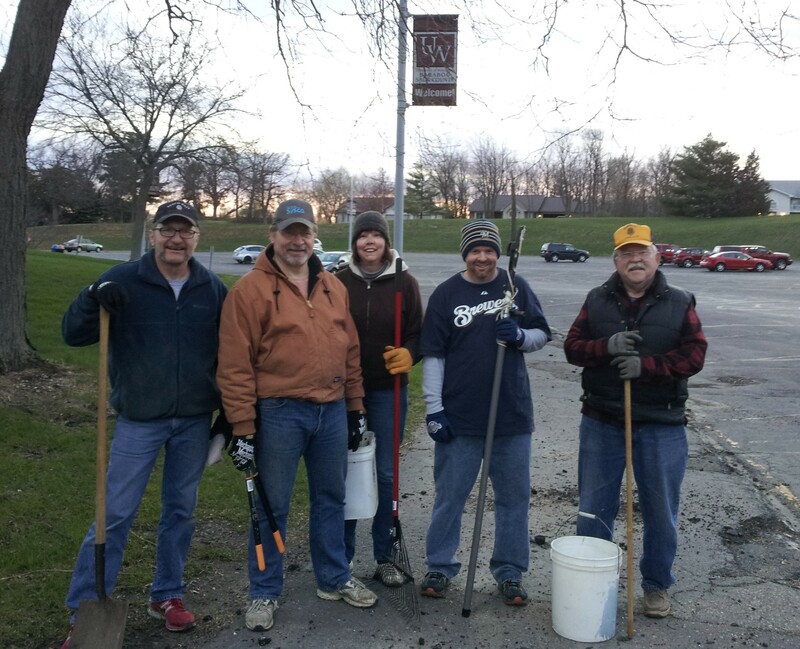 A crew from the Lions Club spent part of Earth Day taking care of the woods at the Baraboo Disc Golf Course. We cleared brush, trimmed trees, removed graffiti, and picked up trash. 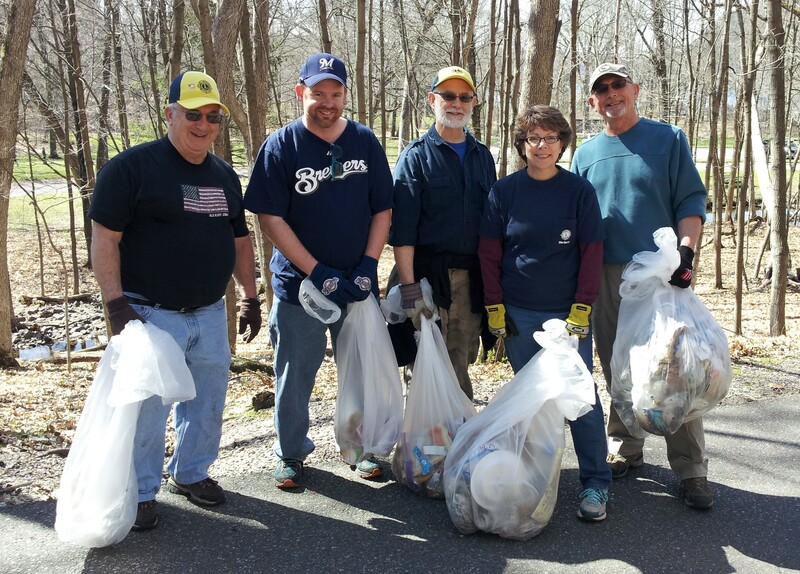 The Lions Club joined Friends of Devil's Lake volunteers at the "Work Play Earth Day." Against the Lions, the trash never had a chance! 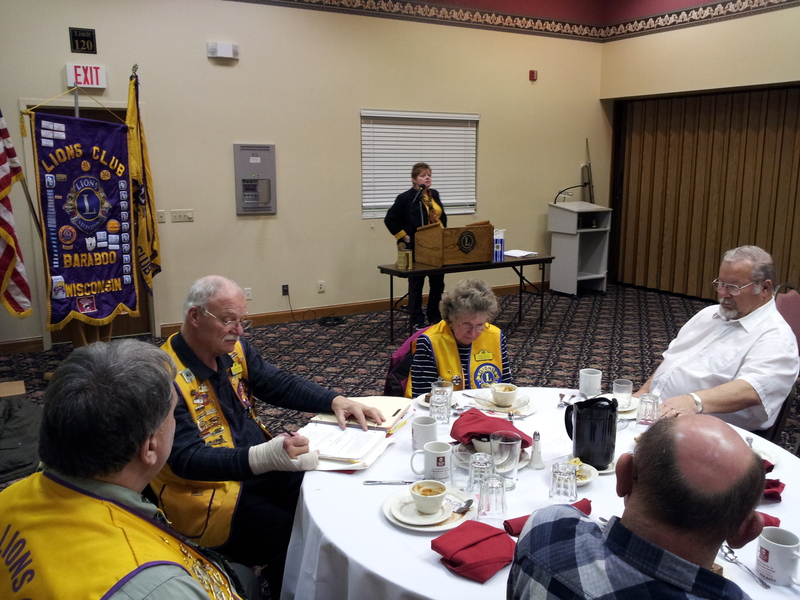 At the February fourth meeting, Baraboo Lions Club Welcomed two new members. Lions Club Membership Chair Tim Lowe inducted new members Rich Schaufuss and Jacob Johnson. 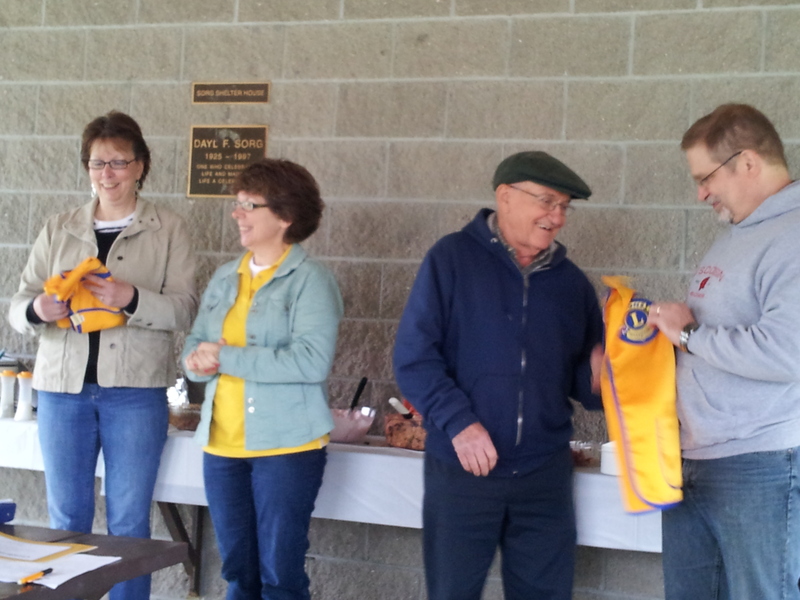 The new members were sponsored by Lions Club Vice President Mim Olsen. Photo L to R: Mim Olsen, Rich Schaufuss, Jacob Johnson, and Tim Lowe. 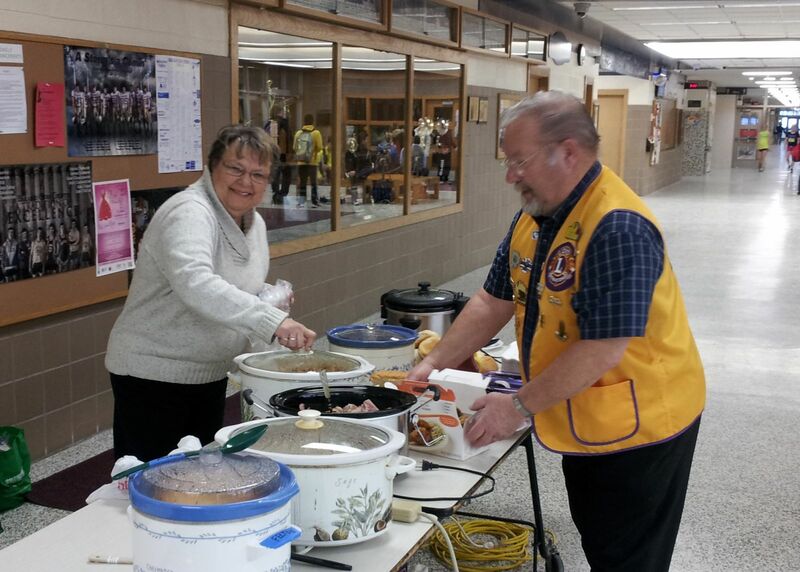 The Lions Worldwide Week of Service kicked off January 10, and the Baraboo Lions Club participated! 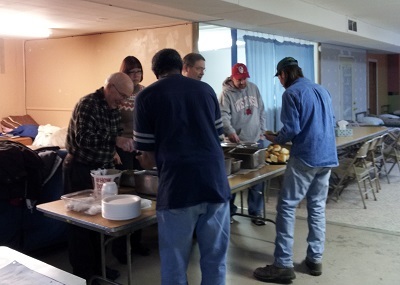 With food donated by the Log Cabin Restaurant, Baraboo Lions served a meal at the Baraboo Warning Center, a shelter for the homeless. 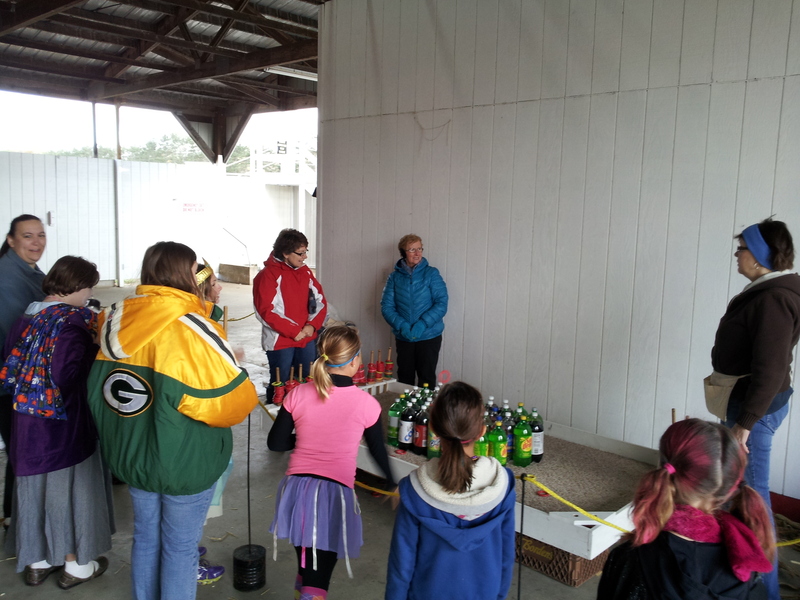 Baraboo Lions helped collect food and stock shelves at the Food Pantry. A single act of service can change a life. When 1.35 million Lions come together to serve, we can change the world! 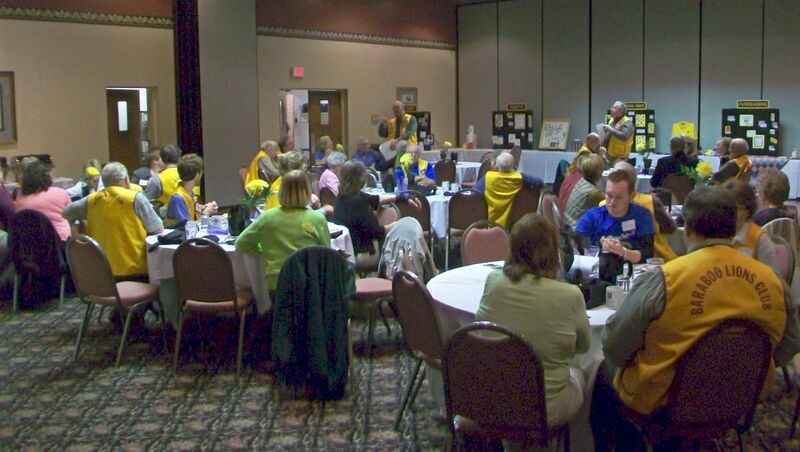 Lions clubs around the world are working to relieve hunger in January. Baraboo Lions came to the aid of a Baraboo resident with mobility restrictions. 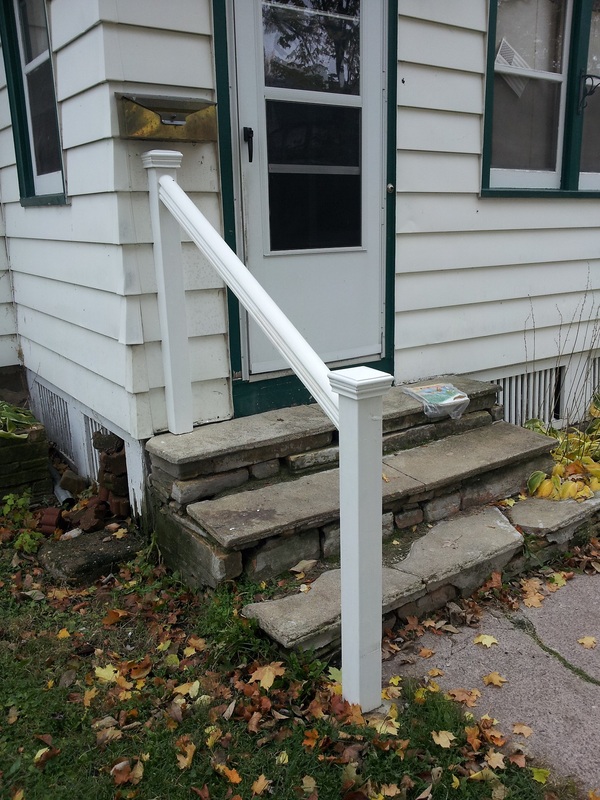 A recent surgery made it difficult for him to get into his home since the front step had no railing. Baraboo Lions provided the labor and materials and the railing was installed. The annual trick or treat event at the fairgrounds gave Lions another chance to run our ring toss - it also gave us a chance to give away a lot of candy to princesses, ninja turtles, and goblins! 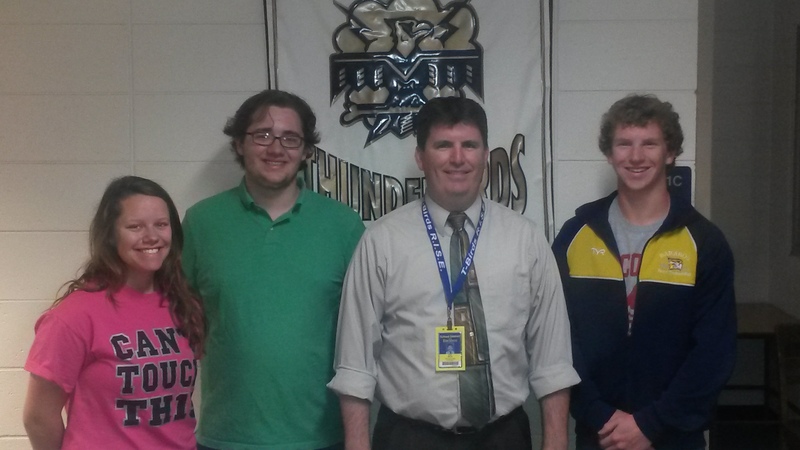 left to right - Markee Bonham (Senior), Boaz Halverson (Skills USA), Lion Cling Brickl, and Brian Cormican (Band). The Baraboo High School homemcoming parade floats were judged by a group of Baraboo Lions. The club awarded the first place for a class to the Juniors, the second place class prize to the Seniors, the first place club prize to Skills USA, and the the second place club prize to the Band. 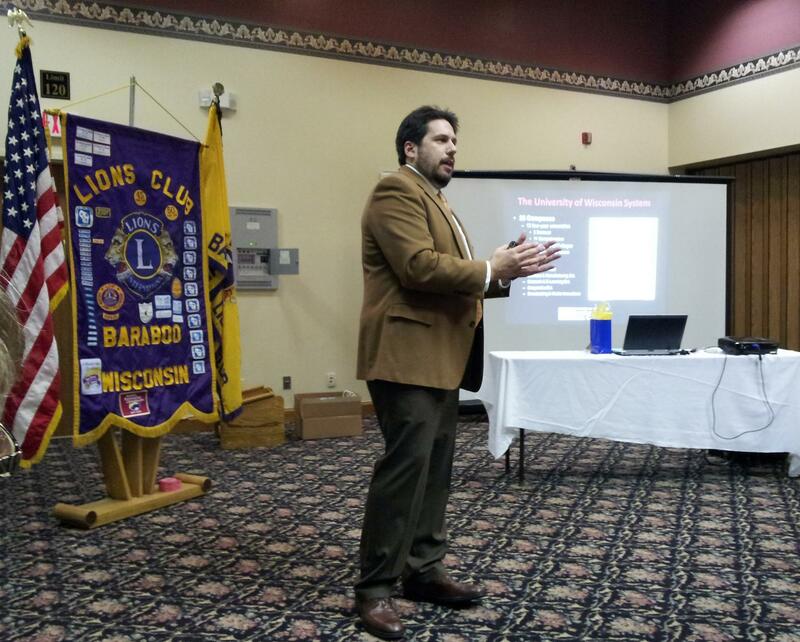 St. Clare Hospital Dietician Travis Stumphebeck spoke to Baraboo Lions about Diabetes and healthy eating. 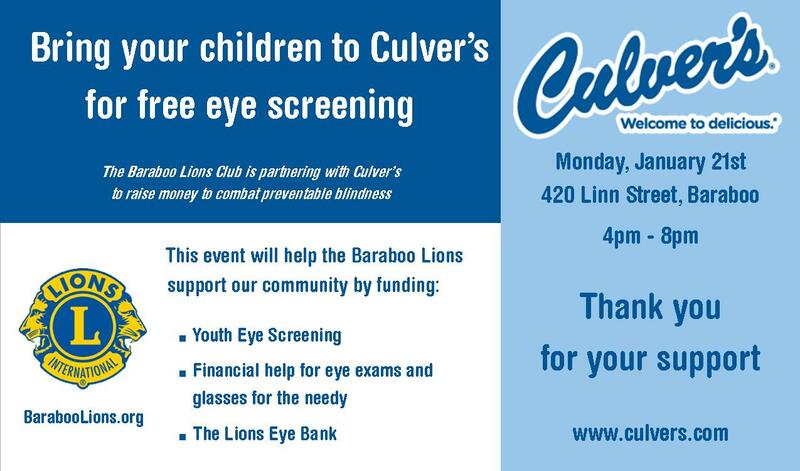 A big thank you to Baraboo Culver's for again sponsoring a free vision screening at their restaurant. Baraboo Lions provide free vision screening so that all children, including those without insurance or who cannot afford eye exams, are screened for indications of vision problems. In addition to the screening at Culver's, Screenings are conducted each fall at Baraboo area schools, 4K sites and day care centers, and elsewhere throughout the year. 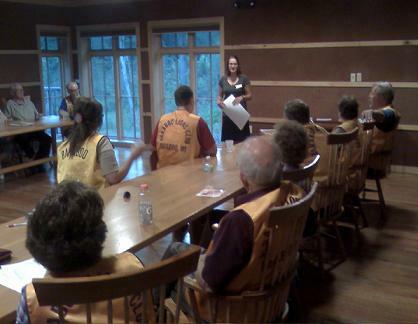 The speaker at our July program night was Baraboo Postmaster Karen Caylor, who spoke about the work done at the Baraboo Post Office. 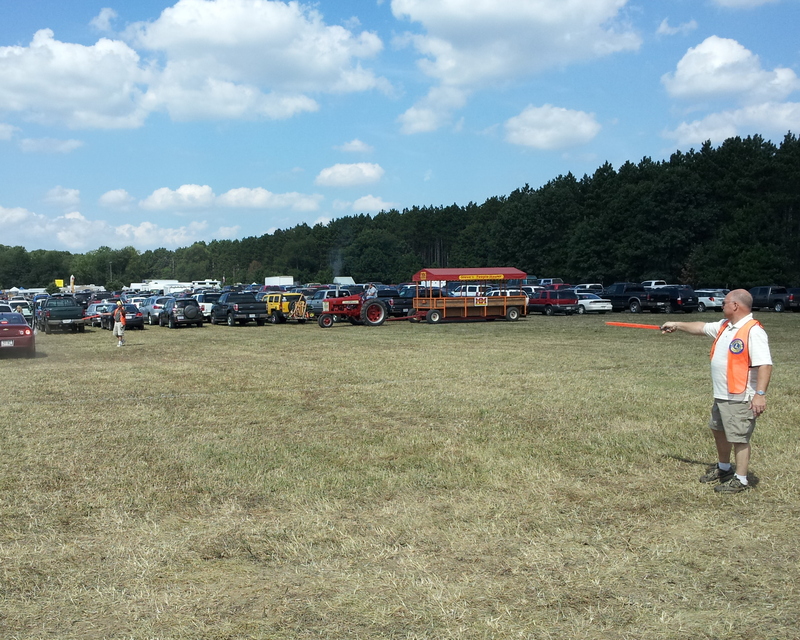 The club held it's annual picnic at Haskins Park. New officers who were present and installed: (front row) Director Kandie Beckwith, Vice President Mim Olsen, President Bill Brickl, Tail Twister Tim Lowe, (Back row) Director Dawn Olsen, Secretary Craig Olsen, and Treasurer Mark Reitz. 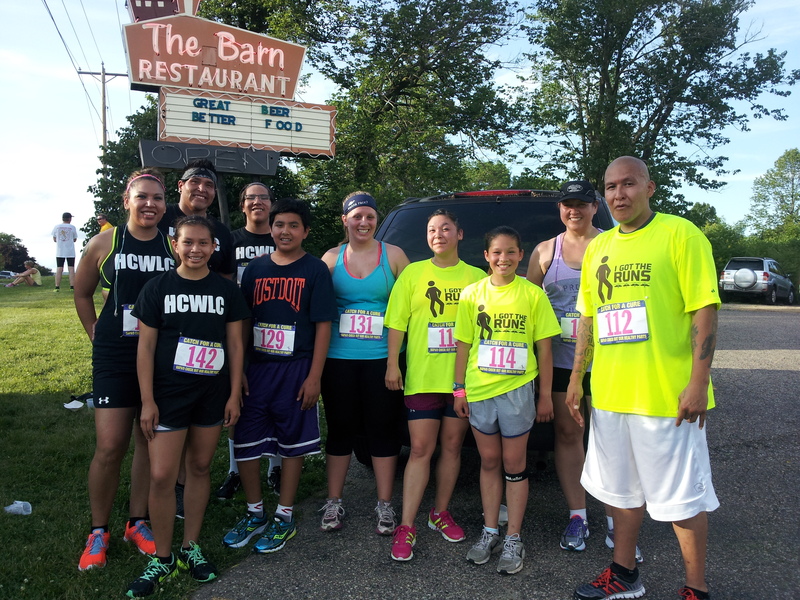 The Ho-Chunk Wellness Center team poses after the race in front of The Barn Restaurant sign. 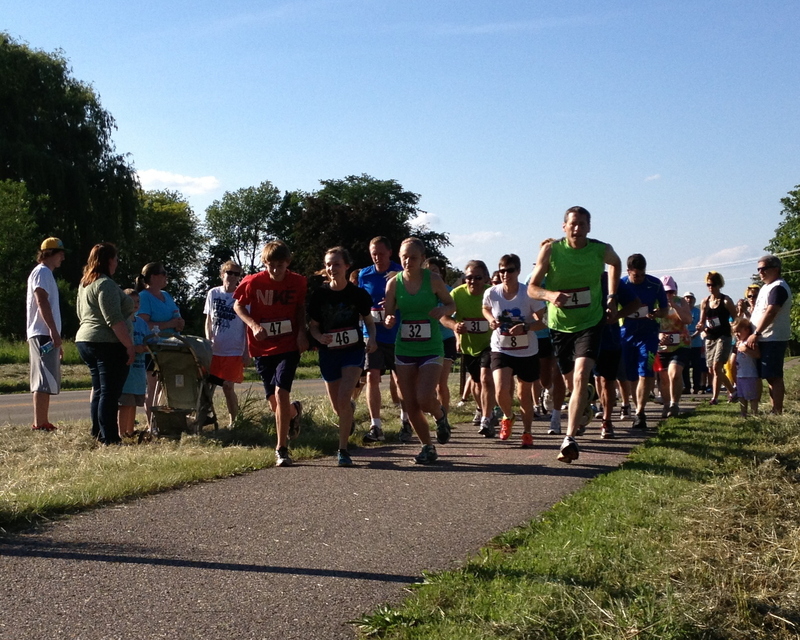 The Baraboo Lions Club's second annual Strides Against Diabetes Run was held June 18 at the Barn Restaurant in Baraboo. The Lions thank all of the runners, walkers and sponsors, Dental Associates, St. Clare Hospital, Barn Restaurant, KTO Web Designs, Community First Bank, Harry Machtan Realty, The Shoe Box, Bara T’s NAPA, Stark Company Realtors, and Mailboxes Pack n’ Ship. Thanks to all of the participants and sponsors the club met and exceeded its goals of increasing the number of participants and funds raised for the club’s eye programs and the diabetes education and awareness programs. 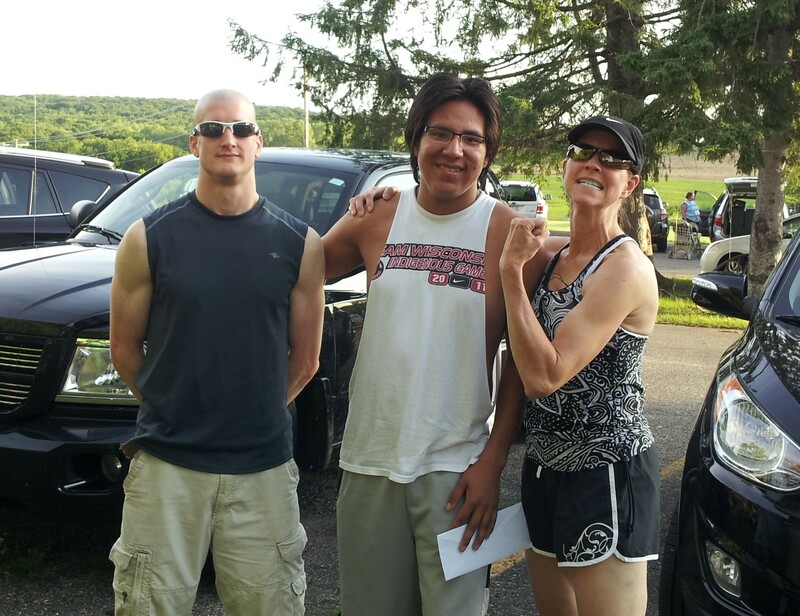 The race winners were (first male) Erik Catherman, (first child) Anthony Green Crow, and (first female) Christine Kortbein. 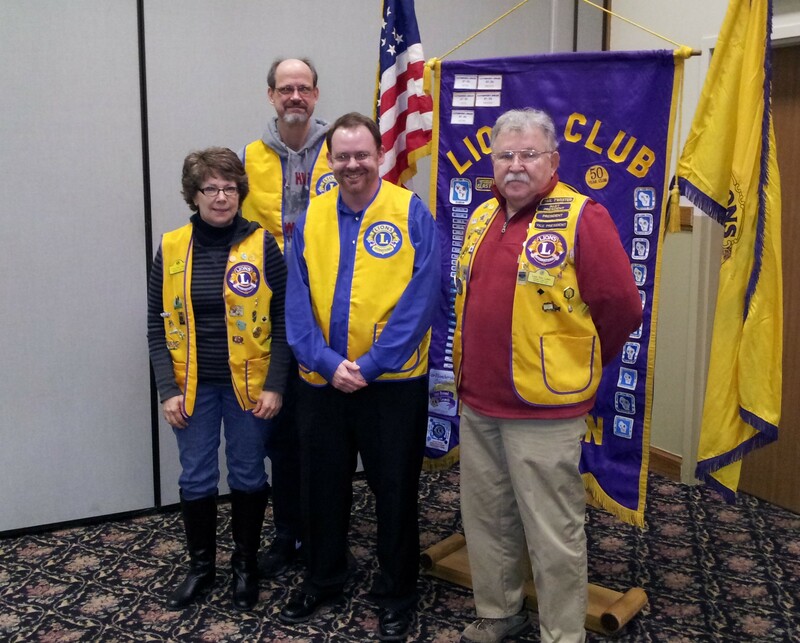 Our club was visited by our Lions District Governor, Mike Bankes, of the Viroqua Lions Club. Melody Mielke, Diabetes Training Coordinator from St. Clare hospital, talks to the boys and girls about healthy food choices. In observance of the American Diabetes Association’s Alert Day, the Boys & Girls Club of West Central Wisconsin, Baraboo Lions Club and St. Clare Hospital provided vision screenings, risk assessments and a variety of healthy living activities at the Boys & Girls Club, located inside the Baraboo Civic Center. 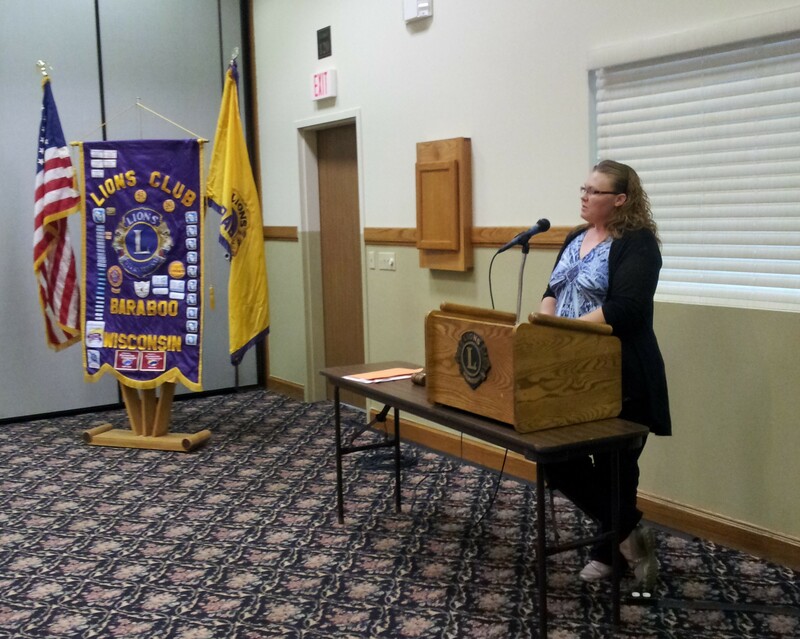 Georgette Young of the Baraboo Food Pantry spoke to the Lions Club about the work that the Pantry does to help feed the needy of the Baraboo area. 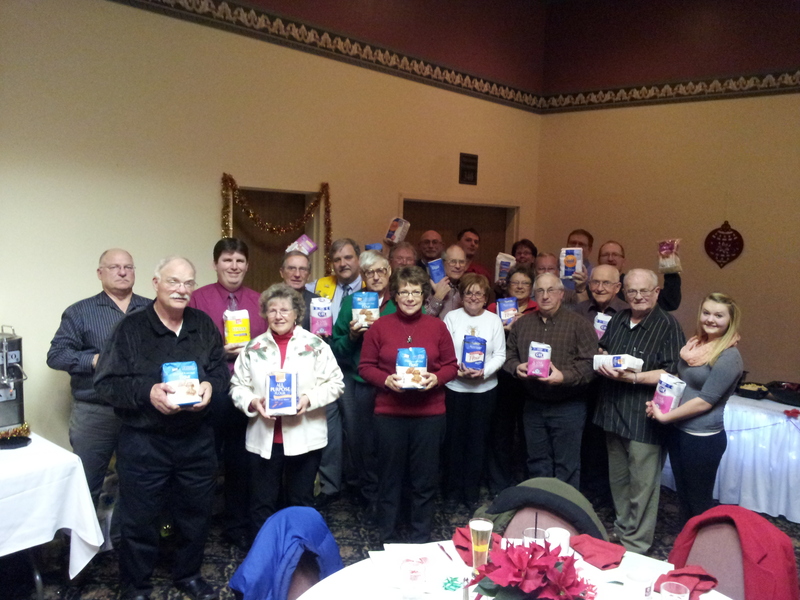 Baraboo Lions learned that the Baraboo Food pantry had a shortage of flour and sugar, so to helped fill the need they brought gifts of flour and sugar to our Christmas Party. The photo shows Lions Club members with some of the 592 lbs. of flour and sugar that they brought for donation to the pantry. Lions member in the photo are (l to r), Bill Brickl, Norm Brickl, Clint Brickl, Nancy Brickl, Rich Evans, Mark Reitz, Jerry Cummings, Tim Lowe, Mim Olsen, Glen Weirauch, Roman Statz, Jesse Ringelstetter, Kandie Beckwith, Jeanette Bolz, Dawn Olsen, Denny Clement, Manny Bolz, Mark Olsen, Bill Olsen, Craig Olsen, Jim Haugsby, and Molly Ringelstetter. Rachelle and Matt Feason of the Hope Through Christ Ministries spoke to the club about their work in operating a warming center for the homeless in Baraboo. The center is located in the basement of their church on Parkway in Baraboo. Club President Craig Olsen congratulates Lion Del Kaney as he is recognized by the Wisconsin Lions Foundation with their highest recognition, "Knight of thte Blind" for Del's years of work in collecting, storing and delivering glassses to the Lions eyeglass collection facility at Rosholt, Wisconsin. 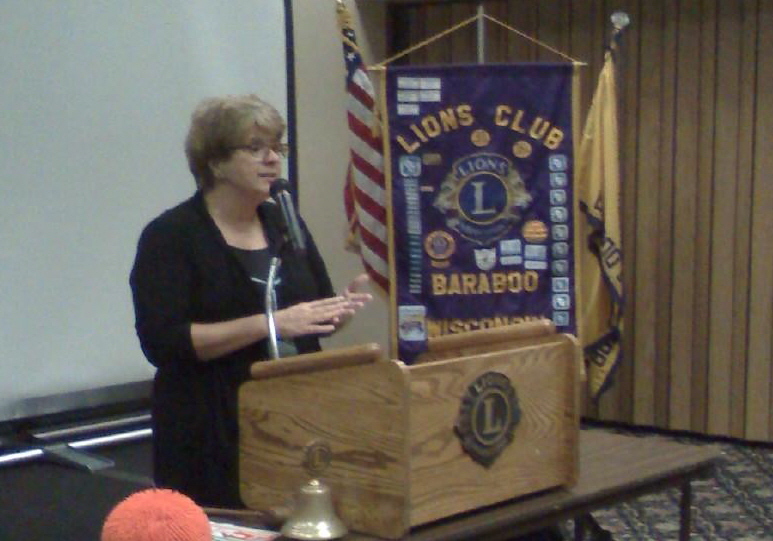 Shelly Mordini spoke to Baraboo Lions about haunted Baraboo at their October meeting. Mordini hosts regular tours of the haunted places in baraboo through Baraboo Tours. 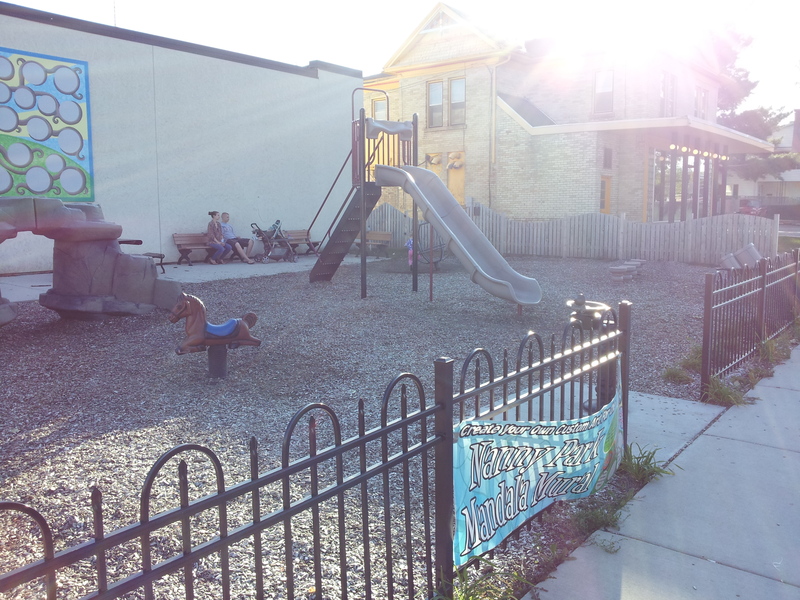 Baraboo's Nanny Park was in need of donations for equipent so Baraboo Lions donated $600 for the purchase of a park bench. The bench was installed as a memorial to long-time Baraboo Lions club member Carl Kuntz who died in 2006 and is marked with a plaque bearing his name. Lions Manny Bolz and Bill Brickl provide eye screening for a child at our free eye screening at Baraboo Culver's on August 13. 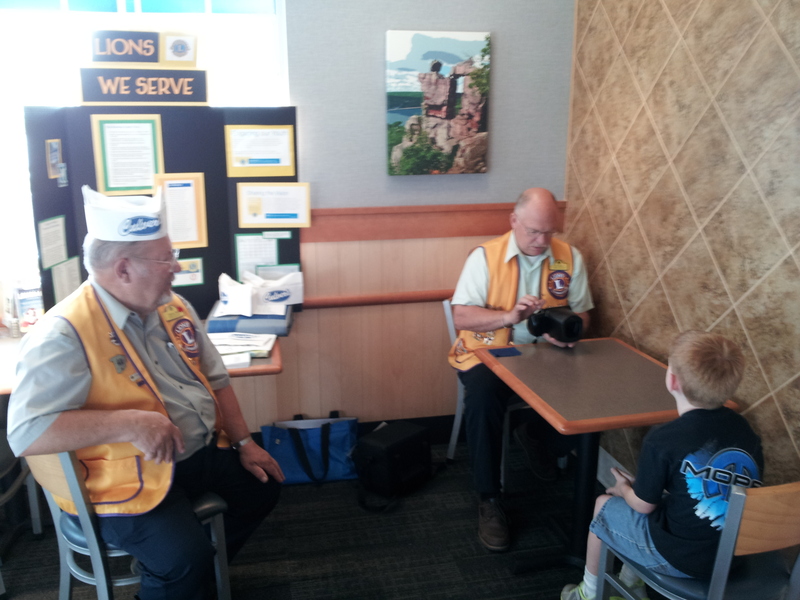 The Baraboo Lions Club conducted its first children’s eye screening with the club’s new PediaVision™ Spot brand vision screener on August 13, 2013 at Baraboo Culver’s. 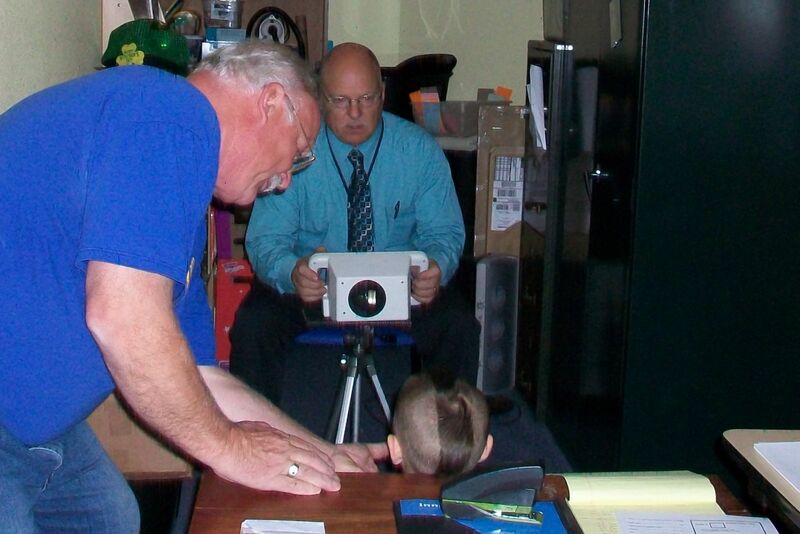 The Baraboo Lions have provided free vision screening in our community for many years so that all children, including those without insurance or who cannot afford eye examinations, are screened for indications of vision problems. Screenings are conducted each fall at Baraboo area schools, 4K and day care centers, and elsewhere throughout the year. The new screener allows the club to offer screenings that provide faster results while screening for a wider range of vision problems. The screener looks like a large digital camera, is handheld, automatic, and produces a comprehensive screening result in seconds. It screens for near-sightedness, far-sightedness, unequal refractive power, blurred vision, eye structure problems, and more. Gold Sponsors ($100 or more): American Family Insurance, Jane Franzen, Bob Hill Memorial Fund, Bravo Center, Culver’s, Community First Bank, Con Amici Wine Bar – Mark & Laura, Corner Drug Store – Janet Fritsch, Don-Rick Insurance, Glacier Valley Ford, Hagar and Associates, Larson Chevrolet, Mailboxes Pack N Ship, LLC, MSA Professional Services, Redlin Funeral Home, Inc.
Baraboo Lions club members Rich Evans and Bill Brickl direct cars to open parking spaces at the annual Badger Steam and Gas Engine Show. Mark and Dawn Olsen joined the club at our annual summer picnic at Max Hill Park. Mark was sponsored by his father, Lion Bill Olsen and Dawn was sponsored by her sister-in-law, Lion Mim Olsen. 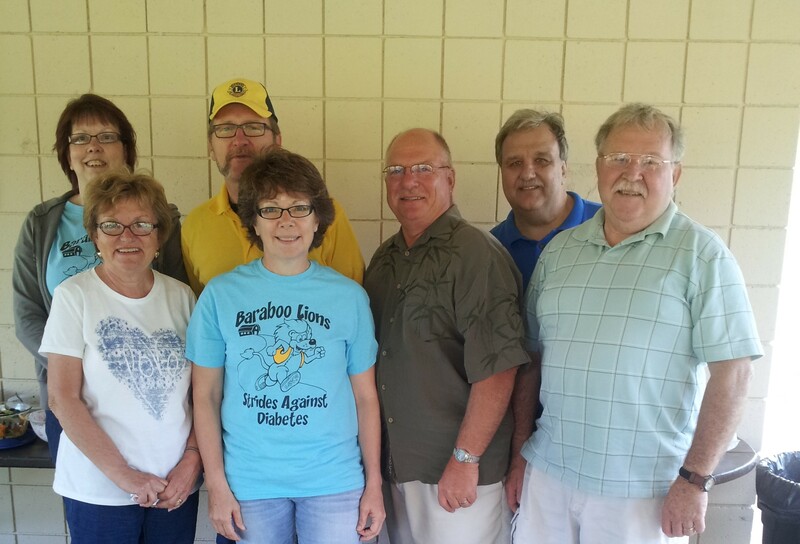 On June 19 the Baraboo Lions Club sponsored a Lions Strides Against Diabetes 5K Fun Run/Walk. Event supporters included St. Clare Hospital, Barn Restaurant, Bananaboat Advertising Graphics, Bara T’s, NAPA, Stark Realty and Mailboxes Pack n’ Ship. The event was used to raise Diabetes awareness and to help raise money for diabetes related Lions projects. Deb Bauer, Executive Director of the Baraboo Area Chamber of Commerce, spoke about her work at the Chamber during our May program meeting. Lion Mim Olsen tells students at Bear-a-boo Daycare about the importance of plants and flowers to our planet in an Earth Day presentation. A short Field Trip followed, children collected plants and flowers and identified the things that made them each unique. 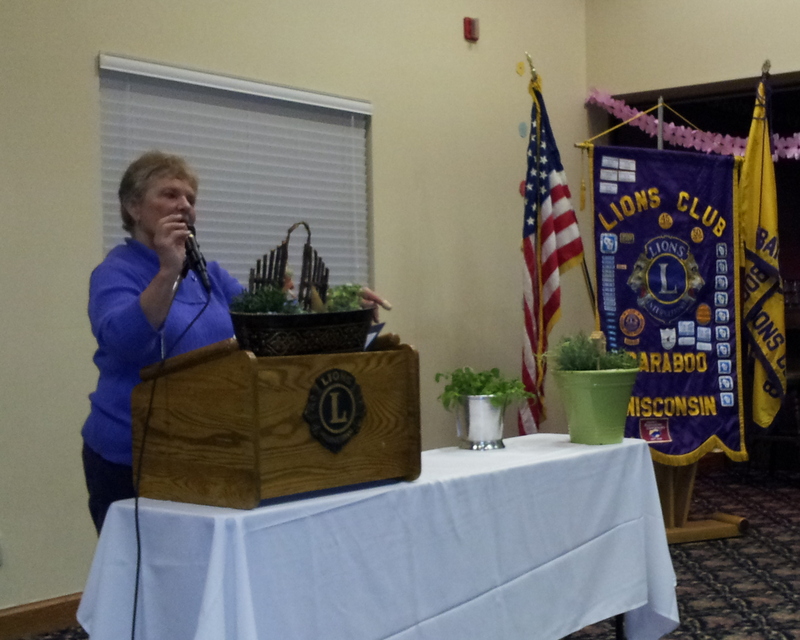 Phyllis Both, local gardening columnist and UW-Extension Master Gardener spoke at the Lions Club Spring Celebration. 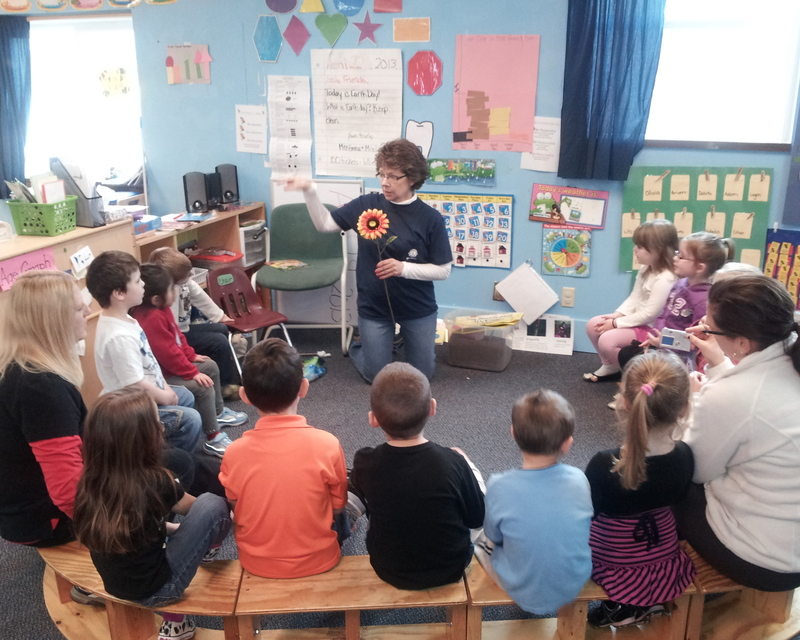 Lions learned about how to be successful gardeners of flowers and vegetables. 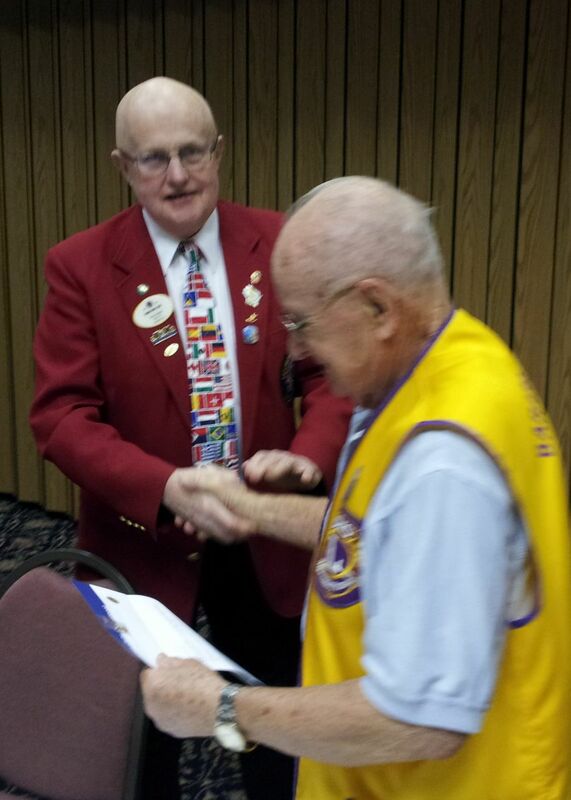 Lions District 27D2 Governor Dierk Van Cleef presents Baraboo Lion Lou Hellewell with his 60 year anniversary certificate. 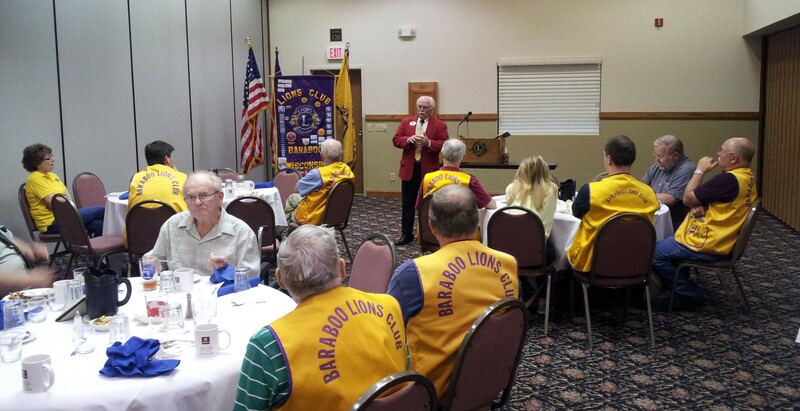 Lou is the longest serving member of the Baraboo Lions Club. Baraboo Lions Jeannette and Manny Bolz help with food service at this year's Baraboo High School boy's basketball banquet. Lions have helped sponsor both boy's and girl's banquets for many years. We provide some of the food, help with service, and pay for all of the trophies awarded to students. 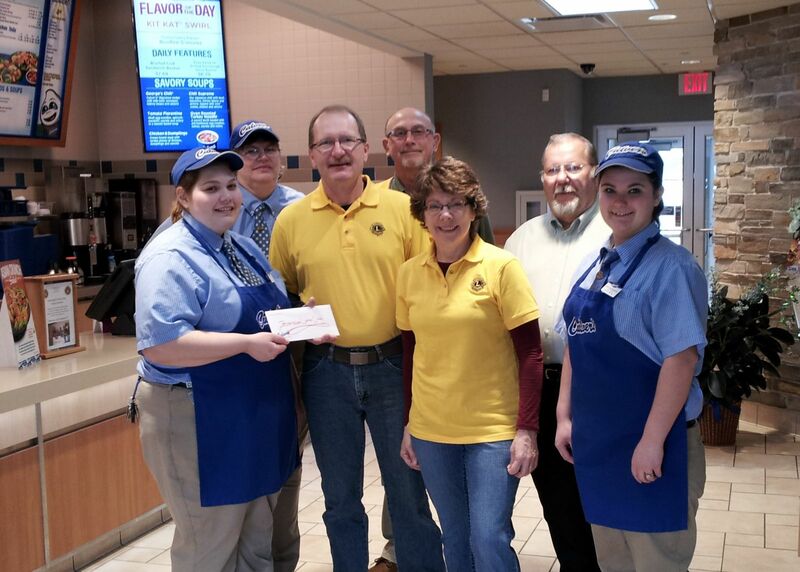 Baraboo Culver's employees present Baraboo Lion president Craig Olsen and Lions Glen Weiruch, Mim Olsen, and Manny Bolz with a $200 donation. The Check will be added to money donated by customers at our January eye screening at Culver's Restaurant to fund a replacement for our ten-year-old eye screener. Baraboo Lions are conducting a fund drive to raise the $7,000 required to purchase a modern digital screener which will allow us to continue to provide free eye screening to Baraboo area pre-school children. Lions provide this free service to members of our community so that all children, including those without insurance or who cannot afford eye examinations, are screened for indications of vision problems. Undetected vision disorders can significantly hinder a child’s learning potential because about 80 percent of learning is acquired visually. Our next eye screening will be on January 21 from 4:00 pm to 8:00 pm at the Baraboo Culver’s. Bring your pre-school age children to Culver’s for free eye screening and help support the Lions Club – a portion of all purchases at Culver’s during this event will fund Baraboo Lions Club vision projects. Money raised will help us continue to provide free eye screening to Baraboo youth, provide eye exams and glasses for the needy, transport eye tissue for the Wisconsin Lions Eye Bank, and much, much more! 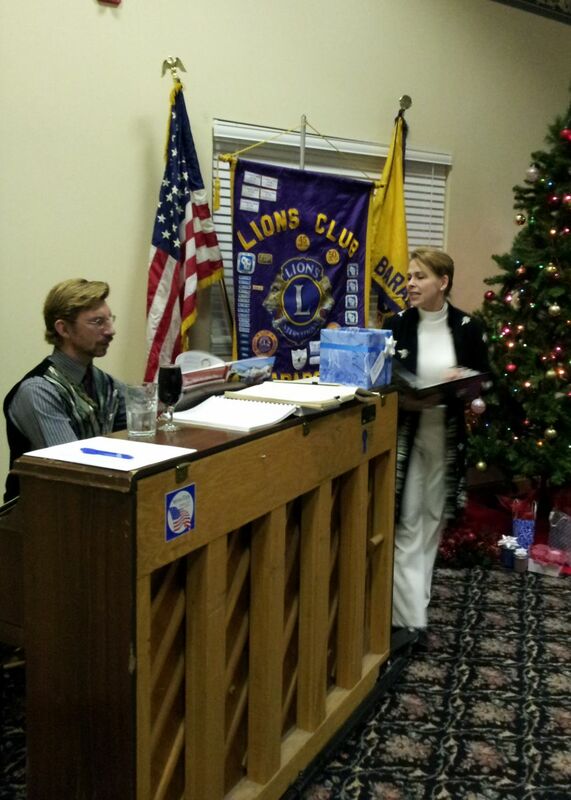 At the annual Baraboo Lions Christmas Party, members and guests enjoyed holiday music provided by Amy Torseth-Teelin and Michael Etzwiler of the Bravo Center in Baraboo. Because of a generous donation to our club, we were able to provide Christmas trees to needy families in our community again this year. Baraboo Lions delivered ten Christmas trees and eight tree stands. Lion Cully Shelton speaks with pre-schoolers at Bear-a-boo Daycare about holiday traditions, including the significance of candles and light. As part of the Baraboo School District’s Strategic Plan, the Baraboo Community Classroom Connection (BCCC) was established to expand community engagement in schools - Baraboo Lions are a participant. The St. Clare Hospital Diabetes Department hosted a Health and Nutrition Seminar featuring Chef Robert Lewis, a Culinary Institute of America graduate who was diagnosed with Type 2 diabetes 14 years ago, and Thorne Wittstruck, St. Clare’s Exercise Physiologist and Cardiac Rehabilitation Coordinator. Lions provided help with registrations and other “housekeeping” work. The photo shows Lions Kandie Beckwith and Mim Olsen helping Chef Lewis with a door prize drawing. Because November is Diabetes Awareness month, our Diabetes committee placed Diabetes information displays at the entrance to the West Square Building. 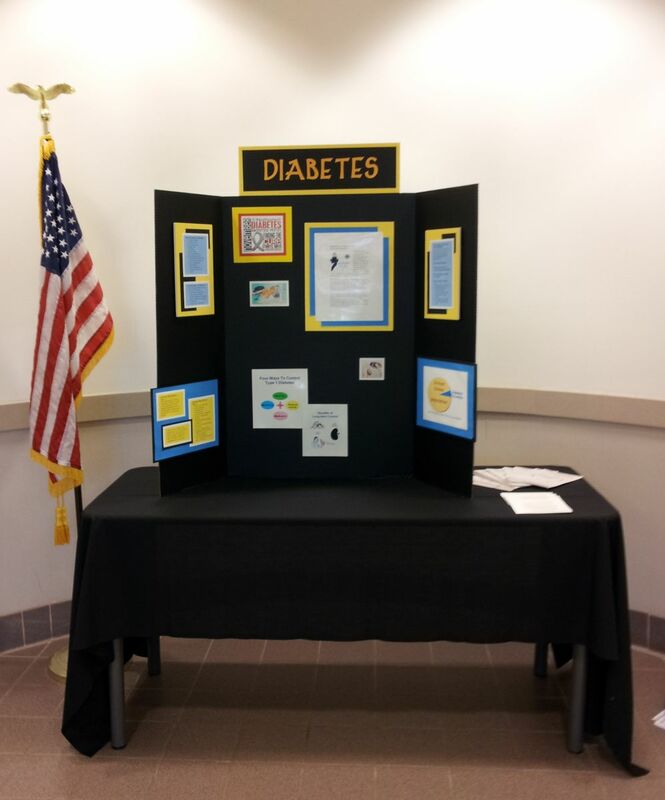 The displays changed weekly and included information about Diabetes, its causes, prevention, and Lions involvement in health issues. 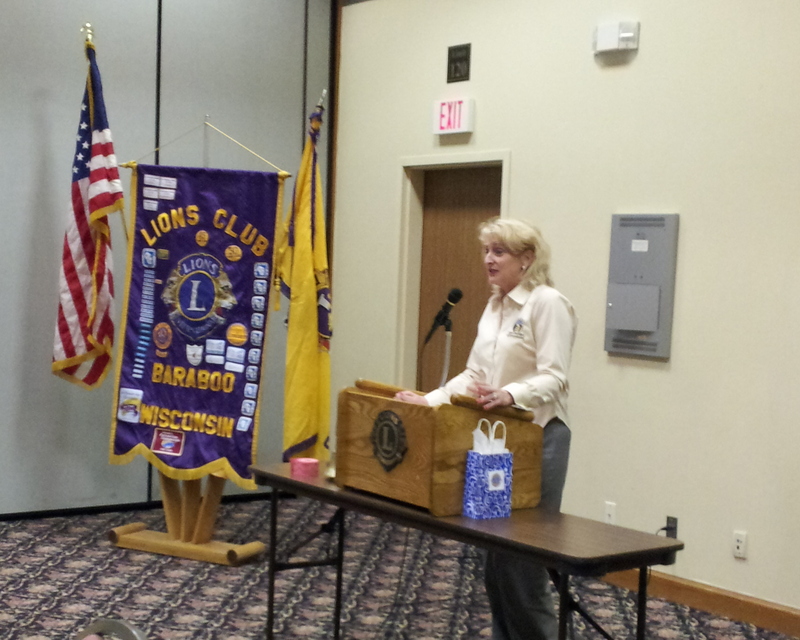 The Dean of the University of Wisconsin - Baraboo/Sauk County Campus spoke to Lions about UW-Baraboo and its role in the UW System and the importance of higher education in Sauk County and Wisconsin. 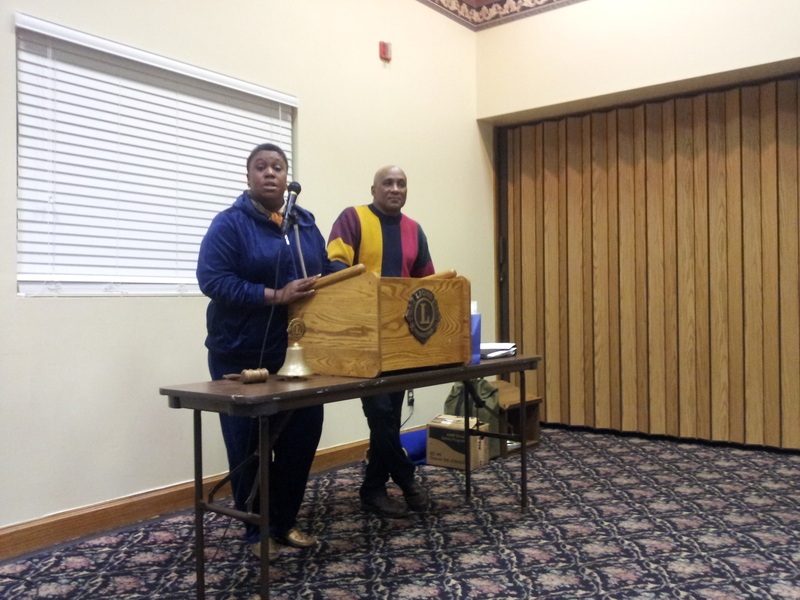 At our October Meeting we hosted a "Meet the Lions" event for a roomful of guests. 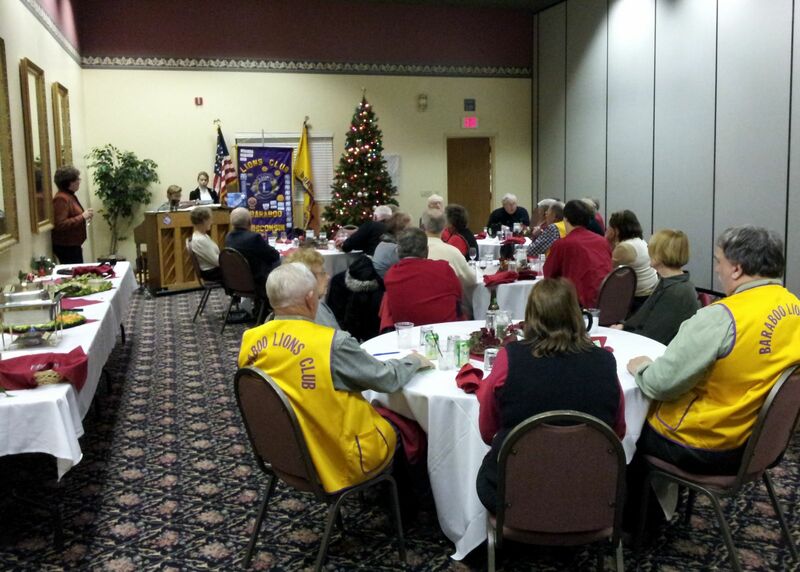 Guests learned about the work of their local Lions club and had an opportunity to meet the members. The Membership Committee constructed a wall-full of displays that told about our work, our history, and a whole lot more! 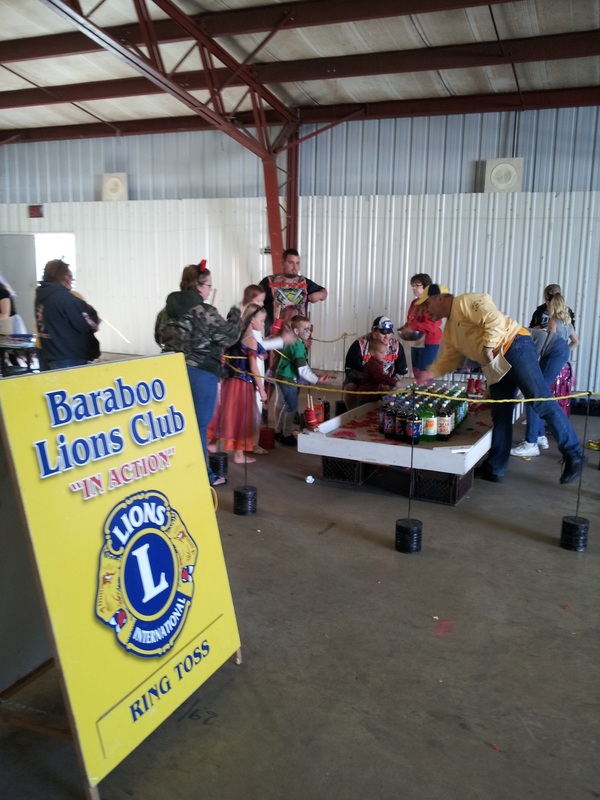 As we have for decades, Baraboo Lions provided the judges for the homecoming parade floats. We also provide cash awards to the best four floats. Judges this year were (left to right) nancy Brickl, Pat Zirzow, Jeannette Bolz, and Cully Shelton. 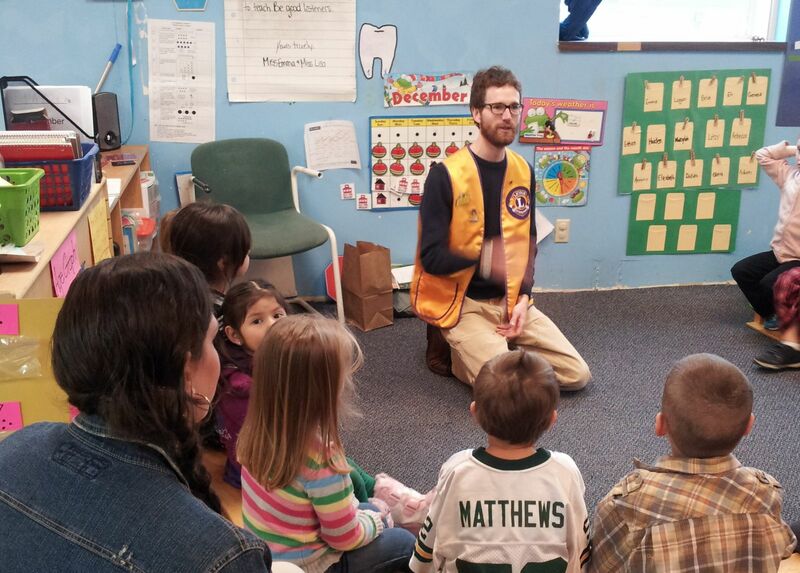 Baraboo Lions provide free photo eye screening for children in kindergarten, pre-K, and daycare in the Baraboo area. The screening detects a multitude of vision problems. Parents are given a referral to a eye-care professional when the screening indicates a potential vision problem. Providing the screening in this case are Lions Norm Brickl and Bill Brickl. 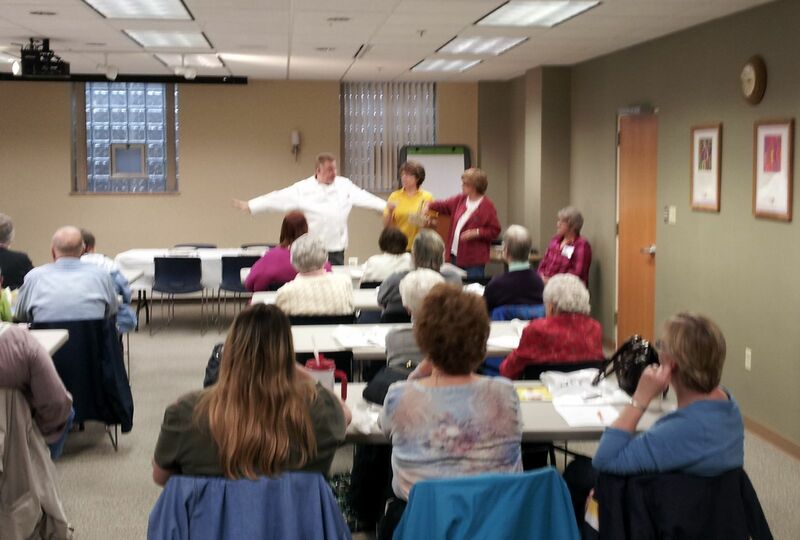 St. Clare Hospital Diabetes Education Coordinator Melanie Mielke, RN, spoke to our club about diabetes, its causes, and prevention. 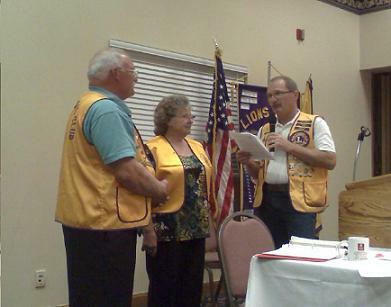 Nancy Brickl was inducted into our club, sponsored by her husband, Lion Secretary Norm Brickl. Welcome Lion Nancy! 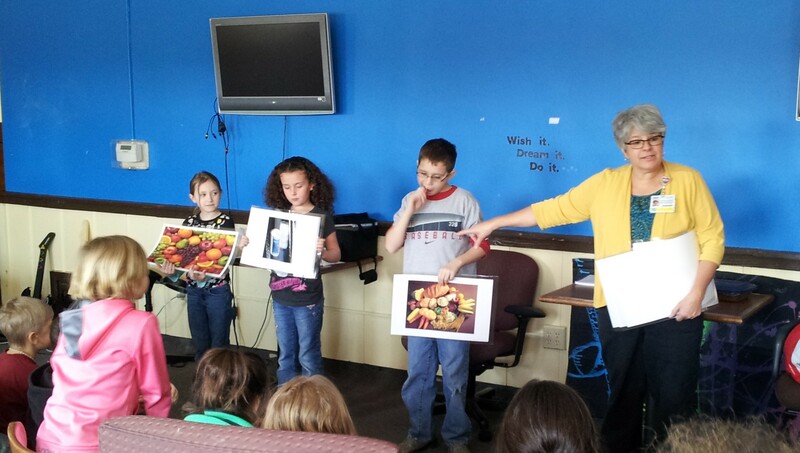 On our visit to the Aldo Leopold Foundation, Lions enjoyed a potluck meal and a very informative program. 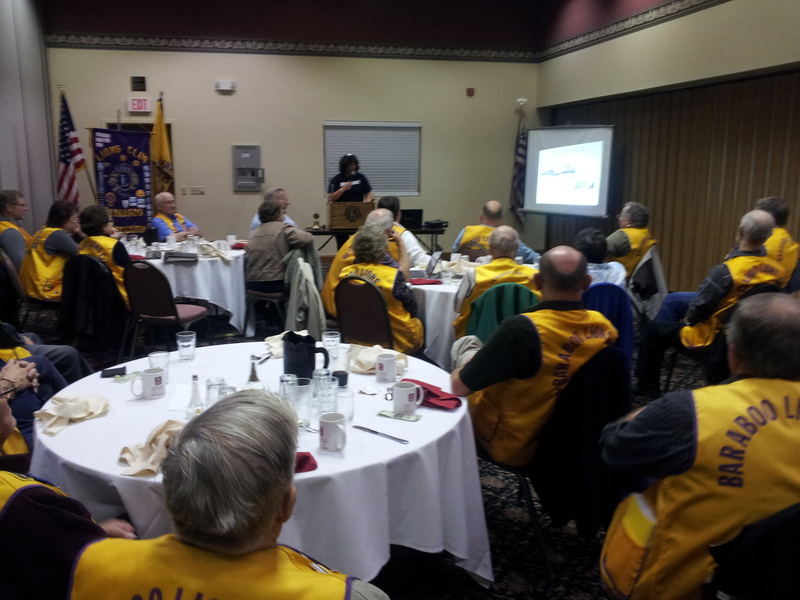 Alanna Koshollek, the Stewardship Coordinator, told Lions about the history and the work of the foundation. More information is availible at www.aldoleopold.org. The annual Baraboo Lions Club raffle is underway - contact any Baraboo Lion to buy tickets! A large group of Baraboo Lions and their families took a trip to the Rosholt in July. 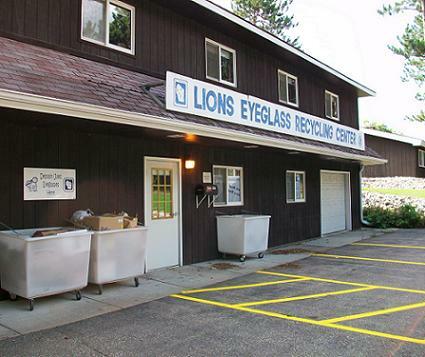 We toured the Wisconsin Lions Camp and visited the eyeglass recycling center. The club brought hundreds of used eyeglasses for donation to the center for recycling. More information about the camp and center can be found at http://www.wisconsinlionscamp.com/. 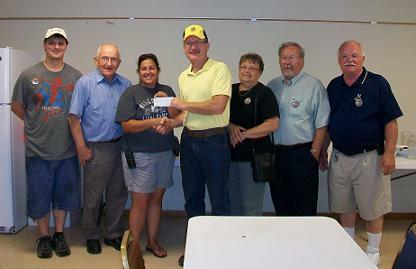 Baraboo Lions also donated $500 to the Wisconsin Lions Foundation! 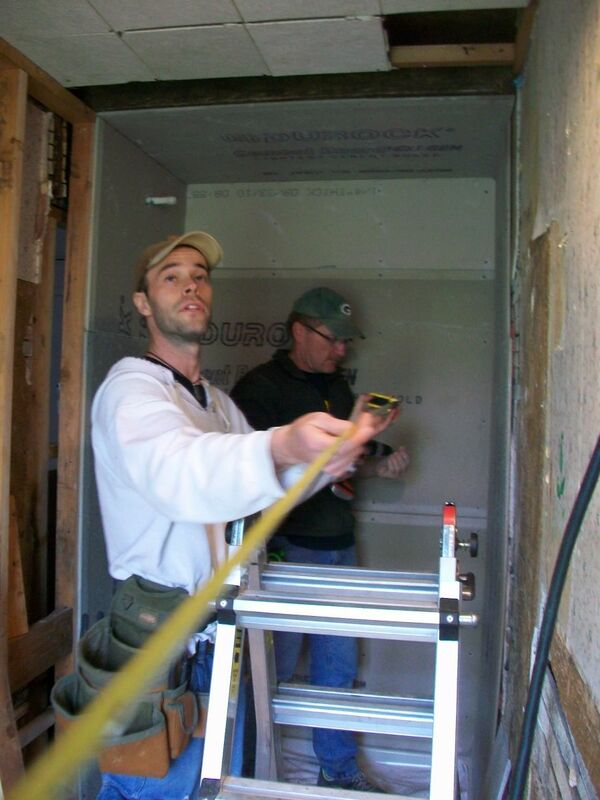 One of our latest projects is the remodeling of a bathroom for Merrimac resident. Recent health problems had caused him to need his bathroom made more accessible. 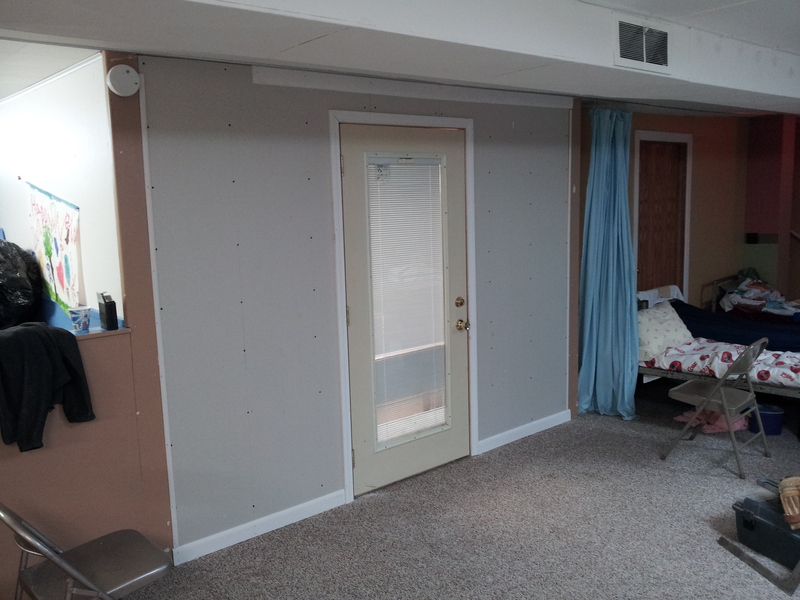 Baraboo Lions and members of the 6:8 service group from Sauk Prairie (http://www.makingservicepersonal.org) have torn out most of the old bathroom and expanded it into a former closet space, reframed some of the walls, replaced plumbing, and installed drywall and cement board so that an accessible shower can be installed. 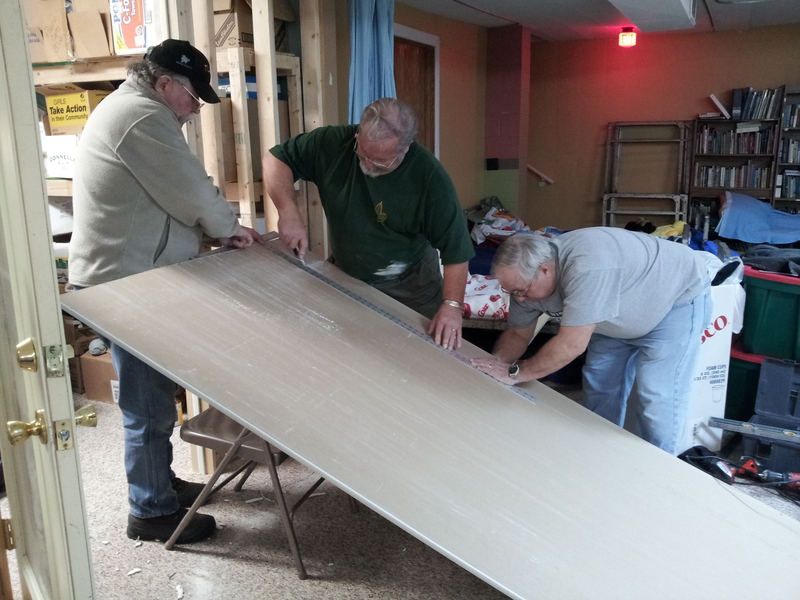 The photo shows 6:8 director John Ramthun and Baraboo Lion Craig Olsen installing wallboard. 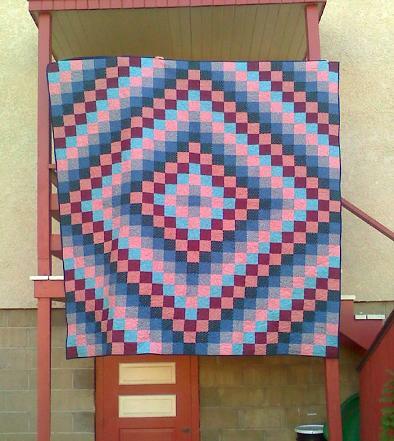 Lions Tim Lowe, Jesse Ringelstetter and Mim Olsen have also worked on the project. Baraboo Lions donated $250 to help Clayton's wish come true though the Kid's Wish Network. Clayton is a 12 year old with a disease called bladder extrophy and Clayton’s wish is to visit Florida’s theme parks. You can find more information about the Kid’s wish network at http://kidswishnetwork.org. Lion Kevin Olsen of the UW--Madison Lions Club was awarded the Melvin Jones Fellowship at the Lions District 27-D1 Convention in Middleton. 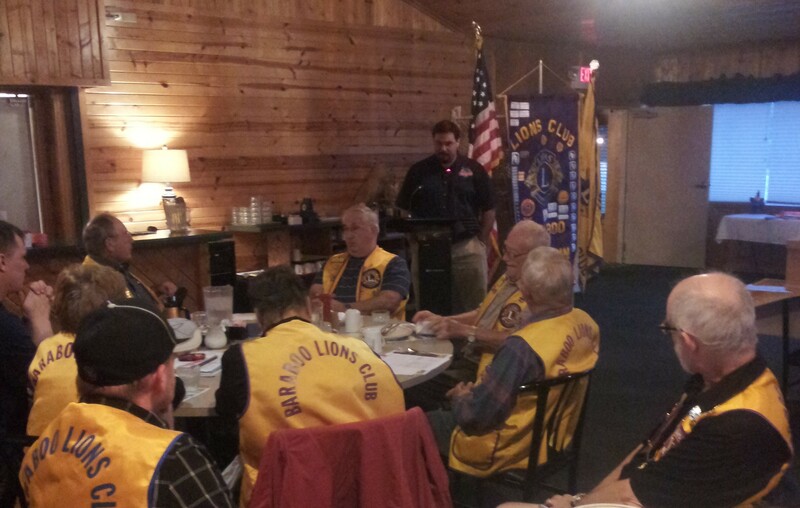 Kevin is a former member of the Baraboo Lions Club and is the son of Baraboo Lions Craig and Mim Olsen and the Grandson of Baraboo Lion Bill Olsen. The fellowship is awarded to a Lion in recognition of exemplary humanitarian work and contributions made to the work of the Lions Clubs International Foundation. 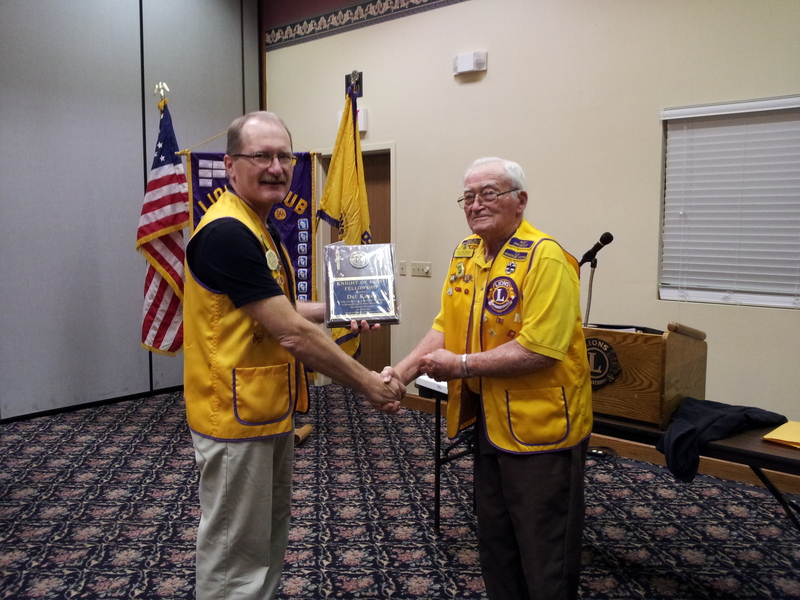 Bill Brickl joined our club sponsored by his brother, Lion Secretary Norm Brickl. Bill, originally from rural Plain Wisconsin, is the Postmaster at Baraboo. Lion Tim Lowe sponsored two new members, Laura O’Leary and Cully Shelton. Laura is the Volunteer Coordinator for Hope House, the domestic abuse and sexual assault service provider in Baraboo. Cully is the Interpretive Program Manager at the International Crane Foundation in Baraboo. Welcome Lion Laura and Lion Cully.